Having recently aquired a couple books of the Nordhoff and Hall Bounty trilogy I am fascinated by the history of the famous mutiny and what became of all the people involved. There is much information available on the web yet very little here at Sailing Navies. So in the interest of helping Sailing Navies become a first rate site dealing with the Age of Sail I thought I might start a thread concerning the well known historical events surrounding the Bounty. Already being somewhat familiar with the basic story what I would like to do with this thread is have Sailing Navies members add any anecdotes, knowledge, etc. not often found in the general historical accounts concerning Pitcairn's Island and the Bounty. Perhaps someone else or myself could also start a new fiction thread concerning the books I mentioned. For any responses on this topic I would be very grateful. I moved your post into this section, since the mutiny on the Bounty is an event that a lot of people are interested in. We've mentioned aspects of it in other threads, but you're right...there was no dedicated thread...until now. I'm a Bligh apologist for the most part. One of the things on my list to see on my first trip to the UK was his tomb in Lambeth. I think he was an interesting man, who has been unfairly maligned. He may not have been the most brilliant officer in terms of people skills, but he certainly wasn't the worst either. That title goes to Hugh Pigot, who paid the price for it. Here's the link to the thread about Bligh. Rather interesting news from Pitcairn Island......the documentary should be good. Today (28th) is the anniversary of the mutiny. I like this image of the scale model of Bounty's launch. (The seagull and the man trying to hit it with the oar is a nice touch Food!). It still amazes me that they all managed to squeeze into the boat. ".... The sufferings of the unhappy mutineers of the Bounty were greater than it could be imagined human nature is capable of bearing. They have been upwards of nineteen months in irons, fastened to a bar, five months of which time both legs and hands were secured, when they were entirely without cloathing [sic], till the natives of a friendly island procured them such articles as they could part with, with some straw, which the prisoners made into hats, and other useful apparel. 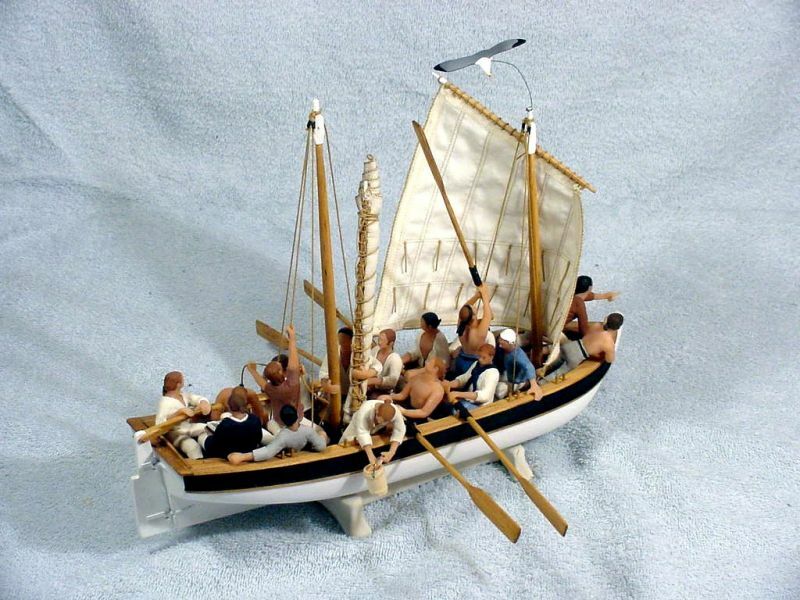 Before the mutiny took place, from the extreme length of the voyage, forty men were put on the allowance of twelve, and even that scanty pittance consisted of food condemned, being unwholesome, and in a state of putrefaction, and which, according to the instructions of the navy, ought to have been thrown in the sea, if it could have been spared. In this manner they fared for sundry months. ....."
'This extraordinary nautical character [Christian] has, at length, transmitted to England his account of the conduct of the mutiny on HMS Bounty. Wondering what those with bigger reading lists than mine would recommend as the best factual account of the story? Two that are available through the local library are Richard Hough's and Caroline Alexander's. The latter has some negative reviews which seem to agree that it's rather long & disjointed & wanders off on tangents, but the reviewers who really liked it really liked it. Not sure I want to read both right away & wondering which would be the best overall. Last edited by Alison on Sat Dec 05, 2009 11:38 pm, edited 1 time in total. The account from “The Times” of 1796 reproduced in Polly’s post of 25th August, 2008 is one of a series of letters which appeared in print in London in 1796 – allegedly written by Fletcher Christian from South America. They were (and are) generally described as “vulgar forgeries”. As regards accounts of the mutiny, the most reasonable seem to me to be those contained in Mackaness’ “The Life of Vice-Admiral William Bligh” (various editions and publishers) and Gavin Kennedy’s “Bligh” (Duckworth, London, 1978).